The Old Foodie: Authentic Chop Suey. A very important Chinese-American event happened in New York on this day in 1896. Contrary to popular myth however, this was not the invention of ‘Chop-Suey’. Between these two dates is our Chinese-American event. 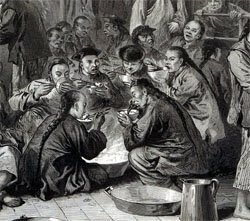 On this day the Viceroy of China, Li Hung Chang ("the man … who, the Chinese say, is the real Emperor of China") was entertained at a dinner at the Waldorf. The main purpose of his visit to the USA was to win support for China’s conflict with Japan, but there was almost as much interest in the Viceroy’s strange eating habits. Not only was he skilful with chopsticks (! ), his own cooks prepared his food – even at the Waldorf. Ris de Veau à la Daubigny. Pois Français. Grouse du Printemps, rôti. Salade Romaine. Chop-suey rapidly lost its ‘strange viand’ status, and within less than two decades recipes for it appeared in American cookbooks, and it was certainly on menus of the St Francis Hotel in San Francisco in 1919. The ‘Chinese-Japanese Cook Book’ (c1914) had several recipes for chop-suey. Three or three and one half pound duck; one tablespoonful of duck fat; one and one quarter tablespoonfuls of soyu; dash of cayenne pepper; two teaspoonfuls of salt; one cup of dried mushrooms; one bunch of celery; one half cup of small white onions; one dozen lotus seeds; one can of bamboo shoots; two pounds of bean sprouts. Carefully wash the duck and remove the bones, then wipe dry and pound the meat until tender. Then chop up about a tablespoonful of duck fat, and fry. Remove all lumps of fat, leaving only the clear oil, and put in the duck meat, cut in small pieces. Fry to a golden brown. Add one and one half tablespoonfuls of soyu, a dash of cayenne pepper, and half a tablespoonful of salt. Cover, and let simmer for twenty minutes while preparing the following: Wash and soak for ten minutes one cup of dried mushrooms, pulling off all stalks and cutting small; cut up a bunch of celery small, and add a cupful of small white onions. Slice a dozen lotus seeds very thin, and half a can of bamboo shoots. Put all in with the duck and fry ten minutes; then add two pounds of bean sprouts and cook five minutes longer. Serve with rice.